“The majority of Catalans feel Catalan, Spanish and European at the same time. All these three identities fit in our heart and we will never allow us to break our heart!” Inés Arrimadas, leader of Ciudadanos party (ALDE) at the Catalan Parliament says during an emotional speech after declaration and suspension of independence for Catalonia. 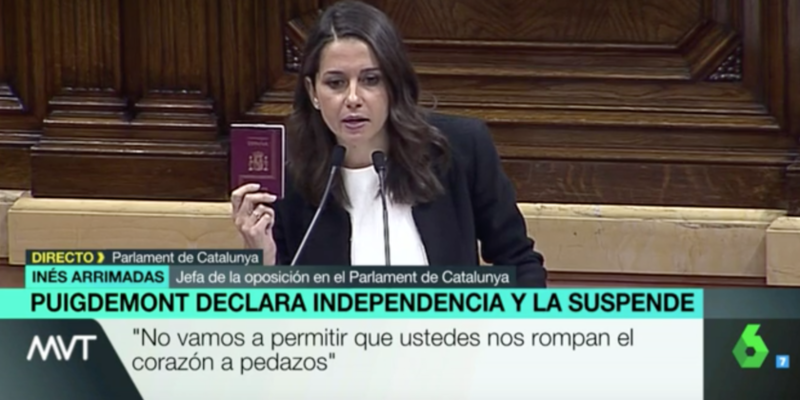 “My parents, my brothers and my cousins live in Andalusia, and I will never allow you to request them the passport when they come to visit me because of your independence project which leads Catalonia to leave the European Union!” she continued. “Sooner or later there will be real elections in Catalonia and we will get a new Catalonia back,” the young politician concluded.